Last December, a fellow Sylvia Plath reader Peter Fydler asked me a question about Sylvia Plath's English tripos book "Two Lovers and a Beachcomber" submitted as part of her Fulbright fulfillment at Newnham College, University of Cambridge, in May-June 1957. Specifically the contents list of the volume. I did not know the answer. Turns out we took a convoluted route in trying to piece it together. 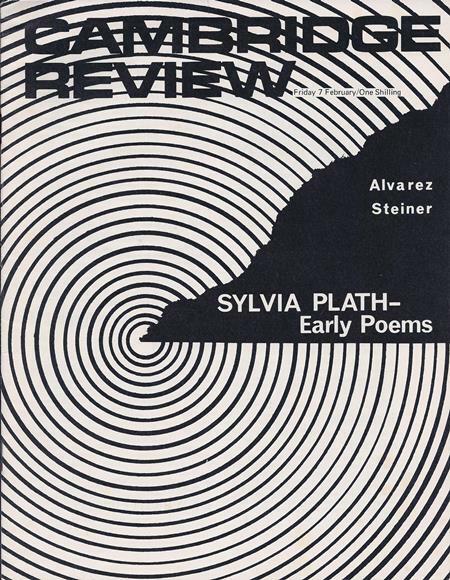 First looking at the Cambridge Review from 7 February 1969, which focused on the recent find of the manuscript of the book in the English faculty library at Cambridge and featured both some essays on Plath and printed several poems by her that were included in the manuscripts. The manuscript contained 43 poems. Though initially Plath envisioned it being slightly larger. On 21 November 1956, Plath wrote to her mother, "My own book of poems (now titled "Two Lovers and a Beachcomber") grows well, and I should have 50 good poems by the time I submit it to the Yale Series of Younger Poets in February" (Letters Home, 287; please note this is the text from the book, but the original letter varies slightly). Plath submitted the book to the Yale Series on 16 February 1957. Anyway, back to the Cambridge manuscript. Smith College has most of the originals, holding 31 poems that probably came from the manuscript. From the finding aid, the manuscript of "'Two Lovers and a Beachcomber' (book) by Sylvia Plath Hughes" includes typescripts of the following poems: "Wreath for a Bridal", "Monologue at 3 a.m.", "Street Song", "Strumpet Song", "Two Sisters of Persephone", "Spinster", "Ella Mason and Her Eleven Cats", "Miss Drake Proceeds to Supper", "To Eva Descending the Stair", "Tinker Jack and the Tidy Wives", "The Snowman on the Moor", "Apotheosis" ["To a Jilted Lover"], "Mad Girl’s Love Song", "Recantation", "Mad Maudlin" ["Maudlin"], "Epitaph for Fire and Flower", "Metamorphosis", "Go Get the Goodly Squab", "Sow”, "On the Plethora of Dryads", "Soliloquy of the Solipsist”, "On the Difficulty of Conjuring Up a Dryad", "Two Lovers and a Beachcomber by the Real Sea", "Natural History", "Aerialist", "Dream with Clam-Diggers", "Black Rook in Rainy Weather", "November Graveyard", "Temper of Time", "All the Dead Dears", "Doomsday". For those savvy enough in math, there are 12 poems missing. Three of the poems for which typescripts are not present in the collection at Smith College, but are mentioned in the Cambridge Review essays, are: "Complaint of the Crazed Queen", "resolve"; and "Shrike". But at first glance we are not sure where they fit. After some time, Peter Fydler found the full table of contents of the book in Gary Lane and Maria Stevens' Sylvia Plath: A Bibliography (1978), on pages 56-57. Which for me is embarrassing as I have a copy of that book. Based on a comparison of what is in the Plath papers at Smith College and what is listed in Lane's bibliography, the pagination of "Two Lovers and a Beachcomber" looked like the below (please keep in mind that those poems enclosed in brackets are the poems for which the original typescripts are missing). I wonder where those missing pages are! Of those missing twelve, the Lilly Library has paginated typescripts for "Lament" and "Pursuit", but the page numbers on those are not from the manuscript of "Two Lovers", but from another assembled book. When comparing the contents of "Two Lovers and a Beachcomber" (May 1957) to Plath's first book The Colossus (1960), it is stated in the Cambridge Review that "[o]nly six were included in The Colossus (Heinemann, 1960) and this number was reduced to four in the American edition (Knopf, 1962)" (244). However, there were eight poems carried over from the 1957 book to the Heinemann edition. As well, there were five carried through to the Knopf edition in 1962. The eight poems brought through the years were: "All the Dead Dears"*; "Black Rook in Rainy Weather"; "Mad Maudlin" ("Maudlin"), "Metamorphosis" ("Faun")* , "Sow" *, "Spinster"*, "Strumpet Song"*, and "Two Sisters of Persephone". The * indicates that the poems appeared in both the English edition and the American edition of The Colossus. Lastly, to make a long story short, Fydler recently found that a complete manuscript copy of the book is held in the Alvarez papers at the British Library. Thanks must go to Peter Fydler for inspiring this blog post. "… in moonlight, / Walking the empty wharf at Alicante / Like a soul waiting for the ferry,"
We will be discussing aspects of their work, including poetry, prose essays, fiction and letters. The course is designed to suit interested readers of Plath and Hughes, postgraduate students, teachers and poets at all levels. TERRY GIFFORD is the author of Ted Hughes (2009), Reconnecting With John Muir: Essays in Post-Pastoral Practice (2006), Pastoral (1999) and Green Voices: Understanding Contemporary Nature Poetry (1995; 2nd edn. 2011), together with six chapters in books on Ted Hughes. He recently edited The Cambridge Companion to Ted Hughes (2011). His seventh collection of poems (with Christopher North) is Al Otro Lado del Aguilar (Oversteps Books, 2011). Terry Gifford is Visiting Scholar at Bath Spa University’s Centre for Writing and Environment, UK, and Senior Research Fellow and Profesor Honorifico at the University of Alicante, Spain. LORRAINE KERSLAKE holds a BA in English and French studies and an MA in Translation and Interpreting from Alicante University, Spain, where she teaches English Language and Literature. She has worked as a translator of literary criticism, poetry and art and published articles and reviews on children’s literature and ecocriticism. Her current research interests include children’s literature, the representation of animals and nature in literature and art, ecocriticism and ecofeminism. ALMASSERA VELLA is Relleu’s original olive press opened in 2002 by Christopher and Marisa North as a Literature and Arts Centre. Comfortable bedrooms, private bathrooms, day-room, loggia, 3000 book library, Free wi/fi, a refectory and a meeting place with log fire. Extensive rear terrace, pool and almond orchard and nearby olive and citrus groves. Relleu is an ancient mountain village with modern pharmacy, general store and bars. Alicante airport is 50 minutes away.